You’ve heard it all before … the future of business is mobile, more people rely on their phones than ever before, tablets are outpacing desktops, and so on .. so why haven't you invested in Sage CRM Mobile yet? The benefits of mobile CRM go beyond tech trends and business jargon. It can actually have a significant impact on your company, your employee’s day-to-day interactions, and your bottom line. Here are 7 reasons you should invest in Sage CRM Mobile today. With mobile access to leads, contacts, and opportunities, your sales team will have the information they need to close more business in the office or on the road. Your staff can check customer history, call notes, and case information on-the-go or before they walk into a meeting with a major customer. When your entire CRM solution is on a mobile device, your team will never miss a beat. Access to the right information at the right time can help reduce the need to return to the office for administrative tasks (place orders, create quotes, update database, etc). It also eliminates the need to call in and interrupt other departments - like accounting or warehouse staff - with requests for customer status or product availability. All the information you need is in the palm of your hand. In today’s digital world, nothing is more time consuming and error prone than dealing with paper. Thanks to the tight integration with Sage 300 ERP, Sage CRM Mobile dramatically reduces paperwork and duplicate data entry. When you provide mobile access to your CRM system, you’ll minimize the need for external sources of data (hand-written notes, spreadsheets, personal contacts, etc). The result? Reduced errors, improved data accuracy, and information that's available to everyone in real-time. When you allow your staff to use familiar mobile devices, such as an iPad or phone, they become more comfortable and likely to use CRM - which is good for your business. With data moving freely between employees and departments, you can tap into new ideas and information that can transform the way you do business. Sage CRM Mobile breaks down department walls to encourage collaboration between teams and across your company. 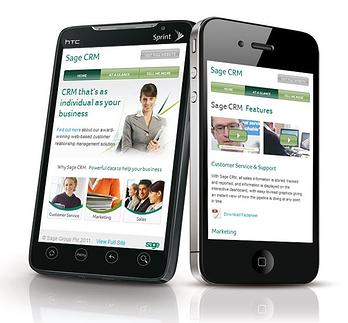 Contact us for more information about setting up Sage CRM Mobile for your company.